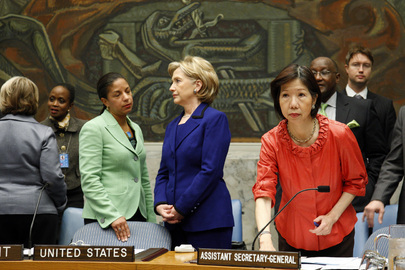 UNITED NATIONS, August 17 -- As the UN Security Council began Tuesday morning its regular monthly meeting on the Middle East, lead UN staffer Horst Heitmann was gone, replaced by his former deputy Norma Chan, who has returned from retirement for the assignment. When Ms. Chan retired in late September 2009, she was offered praise by member after member in an open meeting, and received awards from several members. See UN photo and caption here. Now since the Department of Political Affairs decided to remove Heitmann from the job and slide him laterally into the Middle East and Western Asian post without having a replacement ready, she has been called back into service. Click here from Inner City Press' exclusive story from July 20, 2010. Within DPA there is grumbling about bad planning, and also about the personal high-jinx which led to l'affaire Heitmann. Two of his associates were accused of having affairs which threatened chaos and violence in DPA from the spurned husband, also working for the UN. The point here is not to get into personal lives -- this is why we are not naming names -- but as more than one DPA staffer puts it to Inner City Press, the personal should remain personal and not impinge on Council duties like protection of civilians. And the UN's Department of Political Affairs ought to be able to handle itself with more diplomacy, better planning, more discretion. In the other case, there were absurdly long lunches, walks in the snow in the highest of heels, a Robert Altman comedy intertwined with international peace and security. Security Council Affairs indeed. Ostensibly to clean up the “boy's club,” DPA chief Lynn Pascoe tried to assign a female staffer Michelle Griffin into the Security Council Affairs unit. Heitmann said no, and Pascoe wrote a disciplinary note to his file and that of Aleksandar Martinovic. Click here from Inner City Press' exclusive story at the time, here for Pascoe's displinary memo. Later came the lateral move of Heitmann. Also within DPA some have noticed that the Middle East position is not put out for bid, with an open competition in which speaking Arabic, for example, would be a required qualification. Rather, DPA uses the lateral move without competition. This is to inform you that Under-Secretary-General Pascoe informed staff that, with the appointment of Ms. Lisa Buttenheim as the Special Representative of the Secretary-General in Cyprus, he has decided to laterally move Mr. Horst Heitmann to the post of Director for the Middle East and West Asia Division (MEWAD) effective 16 August 2010. 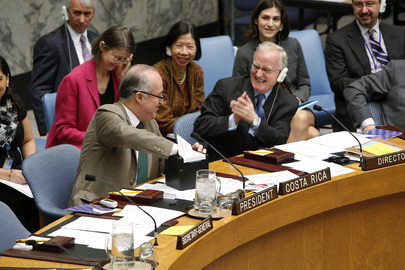 His post at Security Council Affairs will be circulated shortly. Will Loraine Sievers, Heittman's deputy, be promoted to replace him? Probably not, sources say, since she only recently was promoted from the P-5 level to D-1. Another name, perhaps more realistic, being circulated as Heitmann's replacement is Pascoe's current Special Assistance Karin Ann / Karina Gerlach of Venezuela. She is currently at the UN's D-1 level, but seeks a promotion to D-2, which she would get if she takes Heitmann's post.